Google Invests In Wind Power Line : The Two-Way The search giant wants to build a cable hundreds of miles long, 15-20 miles off shore, that would carry power from off-shore wind farms. The cable would stretch from Virginia to New Jersey. Google is making a huge investment in a massive off-shore cable that would eventually carry power from off-shore wind farms to cities along the Atlantic seaboard. 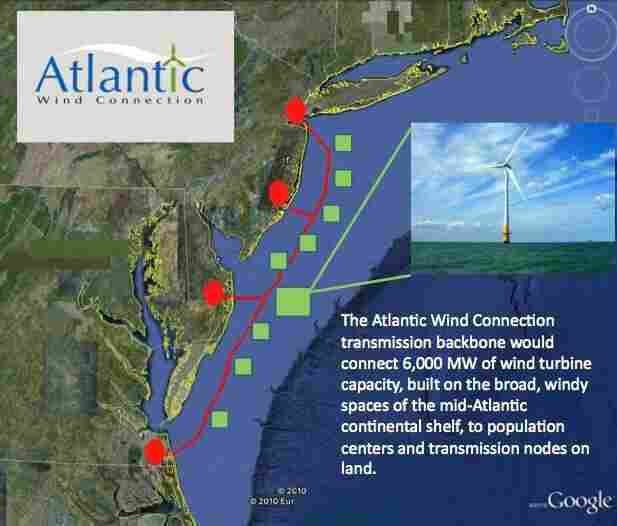 The Atlantic Wind Connection will lie 15-20 miles off shore and run from New Jersey to Virginia. Google says the cable will be able to carry 6,000 MW of wind power. The aim is to make off-shore wind farms feasible and cheaper to build. Farms that are built closer to shore, like the Cape Wind project off the coast of Massachusetts, face objections from people who fear the turbines would clutter the ocean view. Farms miles off-shore would barely be visible from the coast. The eventual cost of the backbone cable will be in the billions. Google and Good Energies are both investing 37.5% of the initial costs of the project, but are expected to bring in other investors. Even before wind farms are built, when complete the cable would take power from Southern Virginia, where it's cheap, to New Jersey, where it's expensive. It would also bypass an area where the electrical grid is already congested.